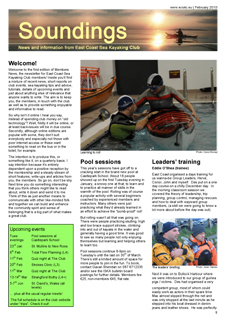 Soundings is the newsletter for East Coast Sea Kayaking Club members. It's a short publication containing a mixture of recent news, short reports on club events, sea kayaking trips and advice, tutorials, details of upcoming events and just about anything else of relevance that anyone wants to write. All of the content is produced by the members, so it really does reflect the interests of the members. It's a high quality publication, professionally printed on glossy paper. Soundings is produced quarterly, in March, June, September and December, or thereabouts, depending mostly on the availability of content and sufficiency of advertising. Paper copies are posted to all who are paid-up members of the club at the time of publication. The newsletter is also made available in electronic form, for download from this website usually about three months after publication. There are also a small number of paper copies of back-issues available on request. Back issues and crossword solutions are publically available for download in pdf format. They can be easily browsed and downloaded from the downloads menu item, or directly here.